Reminder: You have 6 more days to enter my giveaway! I'm so glad I discovered LA Splash. To be honest, I didn't know it existed until I saw this brand at Ulta. They have a nice selection of polishes with an emphasis on the sparkle! They seemed to have lots of glittery top coats as well just general glitter polishes. 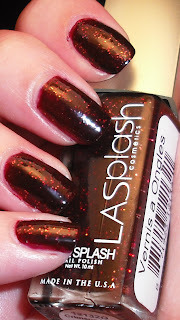 One of the polishes they caught my eye was Crimson Tide. Crimson Tide is a deep vampy red I'd even suggest it's a blood red jelly that is mixed with red and gold glitter. This color is gorgeous. I am so thrilled because often times you come across a deep red glittery color and it's so dark it reads black on your nails with subtle red glitter. It's either that or the standard true red glitters (i.e. China Glaze Ruby Pumps). This definitely shows up as a red on your nails and it the glitter is very visible. It's a great color that I haven't seen in other polishes I have in my stash. I'm definitely excited about this one! What are some of your favorite vampy shades? I really like this color!!! I like the sparkle in it - makes it just that much better. My fav vampy color is either dark blood red or super dark purple, like almost black. I hardly have any vamp shades =(, it seems I do my purchasing via season. This reminds me of cranberries! I just picked this one up this week, I saw it and fell inlove.. so beautiful.